I’m taking this time while getting an oil change to tell you about this AMAZING soup. This soup is so friggin’ easy and so friggin’ good, you’re gonna scream with the pain of realizing how dumb you’ve been for not making it before. That’s exactly what we did. Actually, we slapped ourselves. Before I move on, I’m gonna give credit where credit is due. What’s that Mexican show on the Food Network? Mexican Made Easy or something? With the cute bubbly Mexican gal. She cooked up something similar one Saturday morning. In her case, it had a chipotle cream somethin’ somethin’ added at the end. Not needed, especially if you’re hoping to limit unnecessary calories. -Cut squash in half lengthwise. Leave seeds and such in for now. Sprinkle a bit of olive oil over each half and rub in. Season each half with a pinch of kosher salt and a twist of fresh cracked pepper. 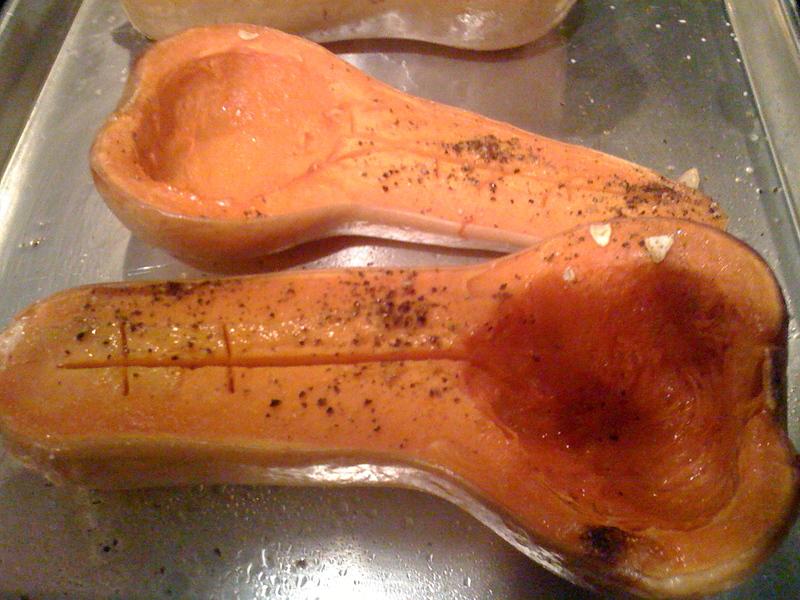 Bake in oven for 30 minutes or until knife inserts into squash easily. Remove from oven. Let sit until it’s cool enough to handle. -Meanwhile, chop onion, carrot and celery into 1/2-inch pieces. 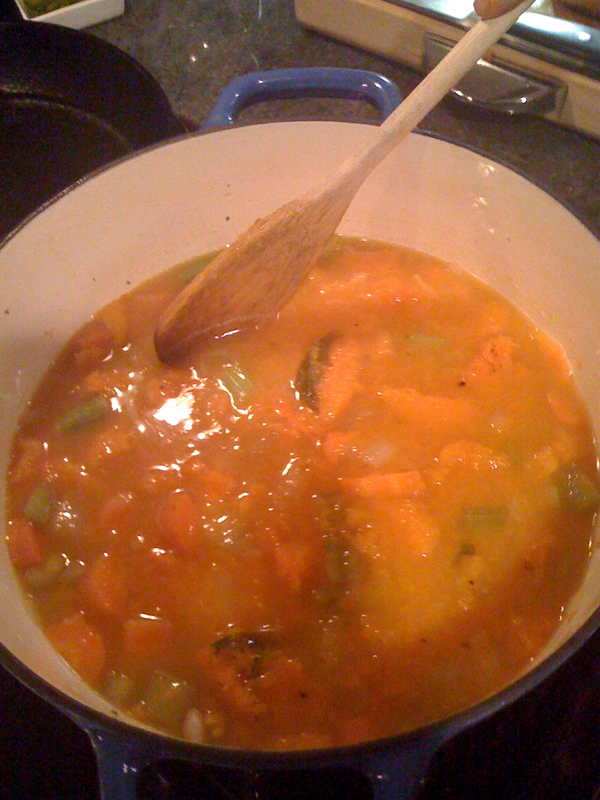 In a 4-quart pot, season vegetables and saute in about 1 tbs olive oil until they start to loosen up a bit – 5 minutes or so. -When squash is cool enough to handle, scrape the squash from the skin and add to the vegetables. 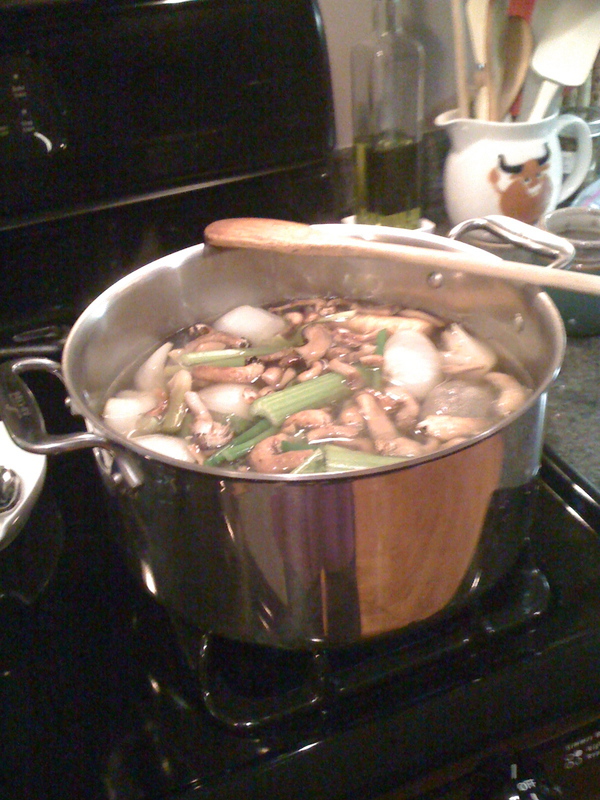 Add enough veggie stock or chicken stock to cover everything. It usually takes about 4-5 cups. Bring to a boil. Turn heat down and simmer for about 30 minutes. All the goodness cooks together. -When time’s up, get our your trusty immersion blender and whir away until it ‘s nice and smooth. Taste that? Good, uh? It’s sweet and savory. Rich and deep. And all that flavor from just those few ingredients. Yup, you and we have been missing out on some serious goodness. Don’t worry, we all feel really stupid about now. Totally flavorful- I almost threw some more flavors in but am glad I didn’t! Thanks! It’s one of those soups that is even better the next day. 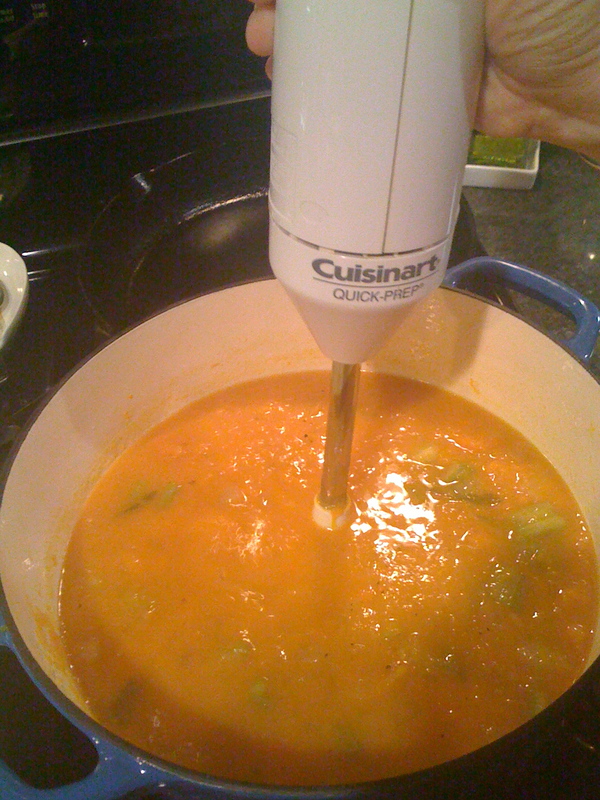 You are currently reading Roasted Butternut Squash Soup at The Dainty Dot.